Whilst royalty has its share of fairytale weddings between commoners and princes, many an Indian middle-class girl in India has married into wealth and status to become a modern-day princess and how! ueen Elizabeth of England had signed ‘The Instrument of Consent" for the marriage of her grandson Prince William with commoner Catherine (Kate) Middleton. According to the Royal Marriages Act of 1772, a sovereign’s agreement is necessary for validating the royal union. The marriage into royalty will transform the destiny of Kate Middleton. It will also hugely influence the thinking and behaviour of millions of young Britons, who see the royal romance as a social miracle in a ‘class-obsessed’ Britain. In India, too, beautiful, talented women have married ‘modern-day princes,’ who are rich industrialists, famous sports heroes or Bollywood icons, to change their destinies. Their stories are as fascinating as the fairytale romance of Kate. Airhostesses, models, actresses — almost all of them belong to middle-class families. But romance and riches knocked loudly at their door and they grabbed the opportunity of a lifetime to marry a Prince Charming,. Shibani Seth, a social scientist who works with celebrity couples on conflict resolution, says, "In India, marriages between middle-class women — who earn fame through modelling, beauty contests, films and TV — and top industrialists or sportstars have been successful and obviously happy. It possibly means that societies in the East and West are ready to accept the Cinderellas but not male Cinderellas e.g. Bikram Saluja, a Mr India married a Parle Bisleri heiress, but the couple is nowhere in celebrity news. It is clear that if a commoner man marries a rich or famous woman, it is not the same as a commoner woman marrying a rich or famous man." Anita Shetty, a prominent Mumbai lawyer, says, "Marriage all over the world is still dominated by the male superiority principle. If a commoner woman marries a titled or famous or rich man, she can glow as the reflection of his glory. Her social position enhances in direct relation to his riches and power. But it is still not the same if a commoner man marries a princess. In the British royal family, men who married queens or princesses have wielded little, if any, power — from Prince Albert, the Duke of Edinburgh, to Sir Anthony Armstrong Jones (Princess Margaret’s husband) and Vice-Admiral Timothy Lawrence, (Princess Anne’s husband) the story is the same. By marrying a queen or princess, a man does not become a king or prince. But a woman marrying a king or prince, instantly holds the title of Princess or Queen!" Decades ago, when the House of Tatas launched Air India, India’s first international airline, a magic gateway opened for beautiful women to enter the world of glamour and riches. The famous Maharaja icon of the airline made it one of the best-known brands in post-Independence India. Air India then set out to find the ‘best looking young women of India’ so that the airline would become an international success overnight. It launched a select bunch of airhostesses, who worked for Air India and accomplished two objectives. Firstly, they made the career of an airhostess, the most coveted job for good-looking Indian women from the middle class, and secondly, they revolutionised the industrial scenario when their airhostesses married the topmost business tycoons of the country. Who were these early airhostesses who acquired business empires with their ‘capital’ of good looks, sensuality and glamour? Horizons, an archival book published by the Tatas, lists them and even features some old-world sepia pictures. The first among them was Parmeshwar Godrej, who was one of Air India’s earliest hostesses before she met and married Adi Godrej, head of Godrej Industries today. Parmeshwar, from a Sikh family, is now a grandmother. She is a socialite who hobnobs with international celebrities like Goldie Hawn and Richard Gere, both of whom have come to India as her guests and participated in her fund-raising dos for AIDS awareness and other causes. 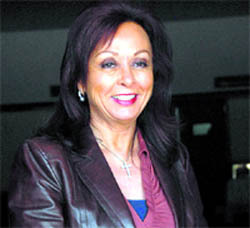 Maureen Wadia, married to the heir of Bombay Dyeing, is the next airhostess featured in the book. 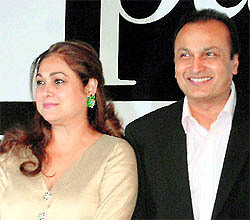 Maureen, reportedly of Anglo-Indian origin, met Nusli Wadia on an Air India flight and became the queen of Bombay Dyeing, one of the biggest industrial empires of India. Maureen also contributed to the promotion of the company brands, such as bath and bedroom linen. While promoting Bombay Dyeing products, Maureen came into contact with the Femina Miss India contest as a sponsor and saw the immense possibilities of using such events to promote her own brands. Glamour attracted her and eventually, Maureen set up her own fashion and style magazine Gladrags and started holding the annual Gladrags Model of the Year and Mrs. India contests. Sakina Mallya was an Air India hostess, too. She married the flamboyant liquor and airline tycoon Vijay Mallya, who heads the United Breweries (Kingfisher) empire. Mallya is known for his rocking parties on his luxury yacht, his sponsorship of glamorous events and most of all, for his annual Kingfisher calendar, in which models pose in skimpy clothes in incredibly beautiful locations. Sakina is the mother of Mallya’s children but is now allegedly divorced from him, according to reports. The procession of airhostesses marrying tycoons dwindled when Air India was taken over by the Government of India and changed its recruitment policy. Also, after the swinging seventies, beauty contest winners from 1969 onwards became models or actresses and many among them married rich men. Among these was Kavita Bhambhani Singh (Miss India 1969), who after a fledging modelling career, married industrialist Jasjit Singh. Today, she is a well-known art collector and owns a gallery. Her sister Sunita Bhambhani, who was a model, married actor Anil Kapoor. Queenie Singh — later Dhody —began her glamourous journey in the mid-1980s. Reports suggest that her real name was Karminder Singh and that she lived in Friend’s Colony, New Delhi, with her Sikh parents, who owned Frick India, an airconditioning business, before she entered the Miss India contest in 1985. Once she won the beauty crown that year, Queenie never looked back. Through her new high-society friends in Mumbai, she met and married ‘Richie Rich’ but married businessman Raja Dhody after a sizzling romance, when his divorce came through. She now is in a relationship with Farhad Taraporewala, a Page 3 personality. Rhea Pillai, though not strictly from a middle-class family, was born to Dr. Door Pillai, daughter of the famous Dhanrajgir family from Hyderabad. Door’s sister Sabita was a well-known socialite designer in her days and Tarn, their brother, tried to become a TV actor. Rhea’s youthful years are a mystery. Reports suggest that she became an airhostess for an international airline and soon left this job to become a full-time model. At around the same time, Sanjay Dutt was going through his own trauma and was jailed in the 1993 Mumbai blasts. She met him through friends from her Page 3 club. For Sanjay, Rhea was the soothing balm when she visited him in jail with tiffin boxes in her much-publicised visits. One Valentine’s Day, when the couple was partying with their Page 3 pals, Sanjay proposed and the group drove at midnight to a South Mumbai temple and were married by the priest in their jeans. However, this romantic marriage, too, did not last long. Hema Deora, wife of Congress leader Murli Deora, was a model and worked as the manager of a textile showroom until she met the rich businessman-politician and joined the ranks of influential political wives. She is an internationally acclaimed bridge player today. Not to forget, Sangeeta Bijlani, daughter of a lawyer, came into modelling and went on to win the Miss India contest in the early 1980s. Sangeeta modelled and also tried her luck in the film industry. Many romances followed until finally, she married the much-maligned Indian cricket captain Mohammed Azharuddin and settled down in Hyderabad. Now she, too, is separated. However, the most dazzling young woman who came into great wealth through marriage and has created a unique persona is Avanti Birla — neither a beauty queen nor a model, but the style icon wife of business magnate Yash Birla. Born Avanti Natu to Maharashtrian parents, she met Yash Birla in college at the age of 16 and the couple fell in love. At 23, Yash lost his parents and sister Sujata in a plane crash and was suddenly left to hold up the family businesses of over Rs.800 crore alone. This is when the family agreed for him to marry Avanti. Also, there are some ‘cute’ marriages through which middle-class women have achieved riches. First in this list is journalist editor Kishwar Ahluwalia, a Delhi girl who worked with Femina to start with and later joined Roli Books as an editor after her divorce and one child. At Roli, she happened to edit Lord Meghnad Desai’s book on Dilip Kumar and ended up marrying the much older British peer. Similarly, Nita Ambani, a graceful classical dancer from an upper middle-class family was handpicked by Kokilaben Ambani, wife of the illustrious Dhirubhai Ambani, to be her elder daughter-in-law and wife of India’s richest industrialist Mukesh Ambani. Lastly, two women certainly deserve the most dazzling ‘Indian Princesses Crowns.’ The first belongs to Tina Munim Ambani and the second, though there is absolutely no comparison between them, surely to Manyata Sanjay Dutt. Both women have kept the media on their toes and led their married lives in dazzling public glare. The older among the two, Tina Munim was born in a middle-class family of seven siblings, of whom one brother was a businessman. Tina’s entry into the glamour world happened truly through a divine plan. An avid photographer on a visit to India photographed her and brought her picture to Femina, recommending her as the cover girl for the journal. Tina was then photographed for a Femina cover and later, all of 16, was chosen to represent India at the International Teen Princess Contest in the US. So close was her large family then that her brother came with her to the Femina office to ensure Tina’s safety. She went – and the rest is history. Tina did not win the top crown but came back with enough credit to be grabbed by Dev Anand as his new heroine. Des Pardes was Tina’s first film. A dazzling film career followed and then, after many ups and downs in her life, she met the younger Ambani heir, Anil. She married him at a fabulous wedding by the family in February, 1991. This means that Anil waited for her till he was 33 and she 32, as he was born in 1958 and she in 1959! The second winner of the ‘Indian Princess Crown’ is more recent and dramatically different from Tina Ambani. Manyata Dutt, months after her controversial marriage to actor Sanjay Dutt, continues to be the centre of Bollywood’s media frenzy. Little known Bollywood actress called Manyata, alias Dilnasheen Amir Ali Shaikh alias Dilnawaz Shaikh is today the queen who rules over actor Sanjay Dutt’s opulent home and fortune. Not much is known about her background, though reports say that before her marriage to Sanjay Dutt, she was married twice. Looking for opportunities in Bollywood, she did an item dance in Prakash Jha’s seminal film Gangajal. 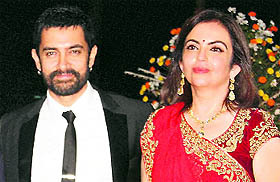 She later met Sanjay Dutt at his worst time, won his trust and married him. Today, with her twins Iccra and Shahraan, she reigns supreme in Sanjay Dutt’s life. In all these marriages, where women from middle-class families have married Indian tycoons or filmstars, their lives have changed dramatically. Most of them have brought glamour, style and chutzpah into the lives of their husbands as trophy wives. Many have taken on business responsibilities and even started new ventures to add to the brand value of their family or husband’s business empire or film career.